Blog Quick Quotes: Mini May-nia with Marcia + Giveaway! Mini May-nia with Marcia + Giveaway! Hello Quick Quotes friends, happy National Scrapbooking Day to you! Marcia here today with an awesome Be Bold mini album to share with you. Quick Quotes has the most amazing albums that coordinate with the new paper collections! That's right, the inside pages coordinate with the collections. I strategically covered up the surfboard on the cover with pattern paper to make it appropriate for my state fair photos.The inside front and back covers also had surfboards that I covered up. Marcia's photography tip: Be sure to pass your camera around, so there are pictures of you too! Check out these Quick Quotes mini albums. They are so amazing! 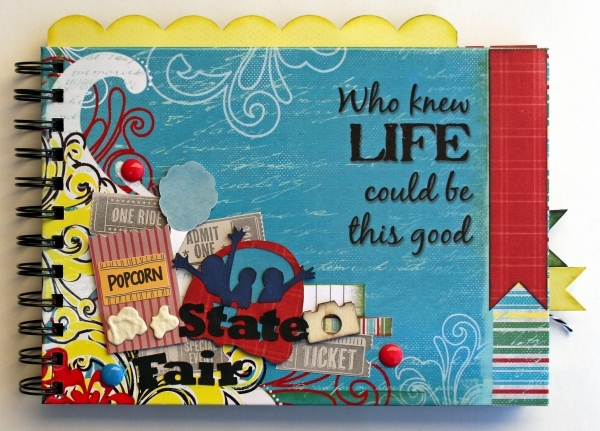 We want to celebrate National Scrapbooking Day with you! How about a fun giveaway? We have some awesome Kiwi Lane Designs templates and of course we will include some yummy Quick Quotes goodness for you too!!! Leave a comment on this post and tell us what you love about paper crafting. Fabulous mini. Can;t go wrong with Quick Quotes. I find paper crafting relaxing. I find that paper crafting is a huge stress reliever for me. Great mini album. Love how you altered the front. Thanks for sharing. I love all the different textures involved with paper crafting. I have always loved playing with paper, scissors and glue! Now I'm also telling a story! Great mini! I love scrapbooking because it is a great creative outlet. I love that you can play with the textures and colors of paper to really turn your photos and stories into a cohesive work of art! Love the mini.....so bright & fun. I like paper crafting because it's relaxing & fun. AWESOME mini!! What a great job!! I love the fact that, with scrapbooking, I'm leaving something tangible; my work, my hadwriting, my photos, for my kids and grandkids to have one of these days when I'm long gone! My mother's journals are something I highly value, and I know my kids will feel the same way about my scrapbooks. Great mini! Love the fun colors! I love papercrafting. I'm a cardmaker and I love making special cards for friends and family. So many fun products to create with! Paper crafting is therapy to relieve stress for me. Paper crafting is one way for me to share a little bit of me with my family & friends thru scrap booking & card making. I'm always looking for new ideas and you have so many. Thank you for sharing. What I love about paper crafting is that you can give everyone the same supplies and you will always have a different take on how to us it. Thanks for sharing some great ideas with us. Thanks for the chance at some great products. I enjoy paper crafting because it's relaxing. I sit in front of a computer all day and to be able to create something with paper and glue is very therapeutic. I was also like to know where did you get the tilt-a-whirl and ferris wheel die cuts? Thank you so much for sharing. I love that when I am done with my project/projects my family will have an heirloom that they can look at, share and keep for future generations. I love to watch my children pull out the scrapbooks I've made and look at them time and time again. There is just a feeling of satisfaction when I'm done with the page. Sometimes it's a card, a bag, but nonetheless it's just a happy heart. It really is therapuetic for me. It totally relaxes me and I just enjoy the hobby. I have never done a mini book before, I find them intimidating...but this makes me want to try one. I love this book it's so cute!!! I love papercrafting. You can make almost anything with it. You can use so many processes with it. It can be folded, cut, textured, painted. Besides. I just love paper and I always have. Love your mini of the state fair. Your love of scrapbooking shows in this book with all the wonderful colors and shapes and how you used the papers, the templates and die cuts. Every recipient of papers crafts such as this mini knows that they are special and loved and future generations will know how we lived, loved and laughed. I love leaving something from the past for the future. LOVE your mini Marcia! This was the perfect choice for the amusement park theme... so bright and cheery! And your cut shapes really add a nice touch!